Color(s): Tri-Color; Black with symmetrical white and rust markings. Tracing its heritage back to the Roman era, this unique breed of dog is very rare in both Europe and America, its classed as the smallest amongst the Swiss mountain Dogs and is utilized by the alpine herders for rearing cattle. It has been used as a companion and watchdog. It has the skills of being all three, its physically strong, hardy and well built yet friendly nature makes it an ideal family dog and companion for the household members. 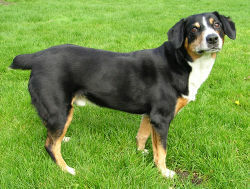 However,the Entlebucher Mountain Dog, is not recommended to 1st time dog owners, they don't take, too well, to being left alone at home, for too long, they tend to get bored quickly, this breed does best, being in an home environment, interacting with adults and older children. They are tolerant of other domestic pets, including dogs, that they have been raised with. The Entlebucher Mountain Dog is territorial, when it comes to his home and family and has the presence of mind to for warn his master of any sign of danger, by barking incessantly. This breed in particular has suffers from eye cataracts, hip dysplasia and PRA health disorders. Gaining weight is also something to be aware of, so a balanced diet and regular exercise keeps them healthy and alert. They don't like to be in warm climates. Bathe them when needed, once in awhile brushing their coat with a hard brush, to get rid of unwanted hairs is advised and clipping of nails is also advised, alongside dental hygiene.